Game day can be a gaudy affair. Luckily, it doesn’t have to be that way. This game day eyeliner tutorial is designed so that you can show off your school spirit without the tacky temporary tattoos. I have used both gold and bright yellow in this look to replace the “Maize” part of “Maize and Blue.” For a more wearable feel, swap out white for silver, or gold for yellow. Step 1: Thoroughly clean your lids and lashes. It’s always a good, hygienic idea to start with a blank slate. Step 2: Draw a thick band on your upper lid along the lash line with the white eyeliner. Step 3: Take a damp angled eyeliner brush and dip it into the darker of the two colors. Start at your outer corner and pat the color onto the white liner, stopping just past your pupil. Step 4: Clean off your brush by rubbing it on a dry paper towel, dampen it again. Place the lighter second color on the inner half of the band of white eyeliner. Careful not over blend the line between the two eye shadow colors. Step 5: Line your upper lid just above the lash line with a thin layer of black liquid eyeliner to add definition. If you choose to go past your lash line to make a cat eye, ensure that the tip of our line points up at the end of your brow line. 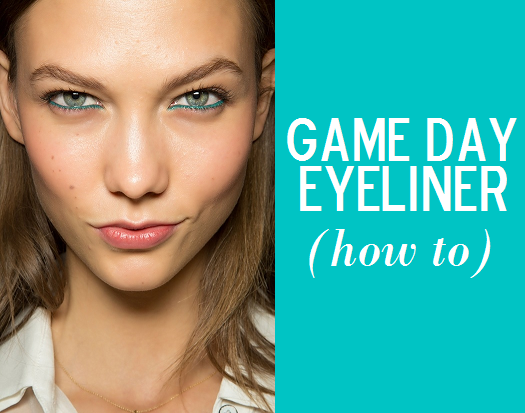 Step 6: Apply a thick coat of mascara, put on your game day outfit, and enjoy the game!